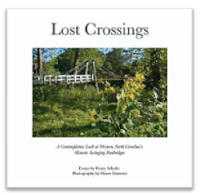 Lost Crossings: A Contemplative Look at Western North Carolina’s Historic Swinging Footbridges is a collaboration between photographer Shane Darwent and author Katey Schultz. It began as a community-funded exhibit and small print run, and grew into a mini-documentary featured on PBS and a regional phenomenon. Our work includes a 7″x7″ 60-page soft-bound book with essays and color photos, a hand-designed map, a gallery exhibition, and a public presentation. As a writer and photographer team, we set out to cross every swinging bridge in Mitchell and Yancey Counties. There are 23 swinging bridges in North Carolina, 13 of which are in Mitchell and Yancey Counties—including the oldest swinging bridge in the state, dated to 1947. During the course of our fieldwork, we interviewed primary sources, crossed each swinging bridge, and took the time to photograph and experience each place. The writing is a literary excursion told through personal narrative. The photos are interpretations of the swinging bridges and everything that came together to make each setting unique in its own right. Together, these works seek to make meaning of the remnants of an older way of life and what the abandonment of these swinging bridges can teach us now. Our project includes quotes from direct sources, narrative descriptions, facts backed up by the Department of Transportation databases, archived photos, and directions to some sites. In 2012, the Emmy-award winning PBS documentary series, “Our State,” featured Katey and her work with Lost Crossings on their show. Please scroll down further, to purchase the book.